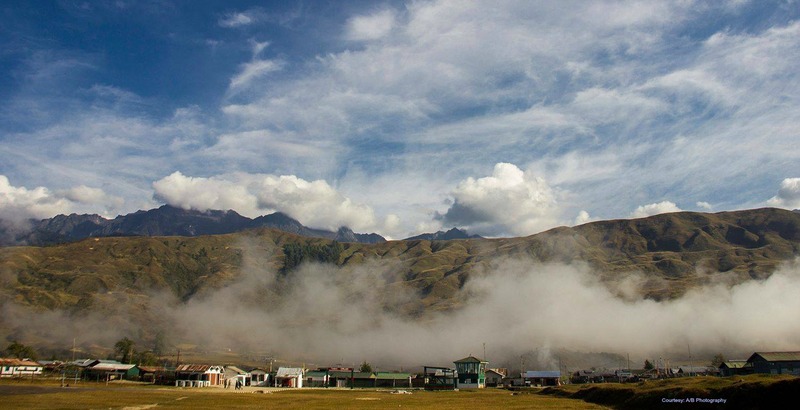 Mechuka or Menchuka is a beautiful quaint little town in Arunachal Pradesh known for its picturesque beauty and also more recently for its annual adventure festival. The town is about 30 Km from the Mac Mohan line that separate India from China and hence houses Indo Tibet Border Police, The Indian Army, as well as an air base with a small landing strip in the centre of the town. Unlike Tawang, you cannot actually go till the border here, and the army officer we met,told us the border although just 30 Kms is about a 4 day trek away and even they don’t go there, but is the sole purview of the Border Security Force. Mechuka town is also filled with numerous cheerful nepali descendants who run home stays and hotels. Mechuka receives snowfall during winter, but otherwise enjoys a very pleasant weather thorough the year. It is the kind of a place you can spend weeks together do nothing, and still feel contended of having spent a great time in there. But for the wanderer there are a lot of things to do as well. The roads are fairly good for the most part, but some parts which receive snowfall and exclusively used by the army trucks with chains are badly damaged and proved to be a challenge even for the experienced riders amongst our group. 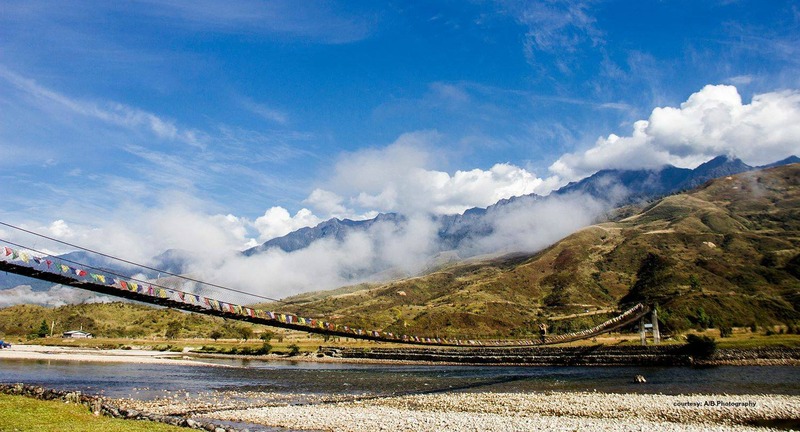 The beautiful Siang River that is the central piece of Mehucka has an amazing hanging wooden bridge over it. I was one of the only brave hearts in our group to walk over to the middle of the hanging bridge, catching the side fiercely, more so when it was windy and occasionally aghast by the missing wooden pieces on the bridge all for a good view and a picture. It seriously surprised me to see the locals carry so much weight on their head and walk over the bridge without holding any of the sides. As in much of Arunachal, Mechuka too is a religious place of predominantly Buddhist faith. Samten Yongcha Gompa built in the 15th century is one of the oldest and well known monasteries here. The monastery gives an amazing view of Mechuka town. Mechuka is said to be a place that Lord Shiva had meditated. The unique energy level of Mechuka attracted Guru Nanak when he was passing though the place and he halted here to meditate in a cave for three months. Today there is a small structure in there, which contains the statue of Guru Nanak, the founder of Sikhism along Guru Rinpoche, the founder of Buddhism. It is said that the Tibetan Buddhists consider Guru Nanak as a reincarnation of Guru Rinpoche. HH Dalailama, during his escape to India was also guided and helped by a Sikh and the two religious practitioners have a good rapport. It is also very common to see many Tibetan Buddhists in the golden temple praying with great faith. This small Gurudwara is accompanied by a cave, which looks more like a crack in between the rocks and is said to be a holy place. It is said that only people with a pure soul can go through it. On a funny note, I was relived to be able to go through it after failing all the three tests of my Tawang Hosts which required me to have larger hands and a better aim, Guru Nanak just wanted me to be reasonably thin!! After one goes through the cave, you can reach the river beneath. The river below is filled with a lot of pebbles of either black or white color. The local folk lore says that if you make a wish and pick a pebble from the river with closed eyes, the color of the pebble will indicate if your wish will come true or not. White pebble, if it will and Black if it will not. The result does not change no matter how many times you repeat the same feat. An Army officer who was posted here tried this once 13 times and got a black pebble every single time. Alas, I came to know of the story only in a different place and I couldn’t give that a shot myself. We also went to a Gurudwara built and maintained by the Army unit. A Sikh soldier was in charge of the place and took great pains to explain to us a lot about his religion and the gurus and the local folk lores associated with their Guru. Behind the monastery you can also see the picturesque river flowing by. The army people here are extremely friendly and we ended up having tea with them one more time. One of the more famous villages nearby is called Dorjeeling, pronounced almost like its more famous namesake hill town of Darjeeling. Dorjeeling a small town of less than 50 families has much folklore associated with it including some of Guru Nanak’s stay in this region. The small half day trek may also be considered for its scenic beauty and the friendly memba tribal people who inhabit this region. Mechuka also has a very cute cow called Mithun. It has long eye lashes and has a very cartoony feminine look about it. Cow slaughter is not uncommon here and my friends considered it to be very yummy as well !! 1) Mechuka has some popular home stays. Some of which you can find here. 2) Nearest well connected cities/Towns to Mechuka is Dibrugarh in Assam or Itanagar in Arunachal Pradesh. Hired taxi or Own Car/Bike from there is the best way to Mechuka from there. 1) The roads are narrow, often bad and the fuel stations enroute are minimal. So drivers need to be experienced in hill driving and careful fuel planning is a must. 2) The mobile signals are unpredictable at best and most private operators don’t have any functioning network. Landlines and phone booths are available to make any important personal calls.